Pukeho means "on the hill" which is the perfect name for the sawmill set in a peaceful rural setting. 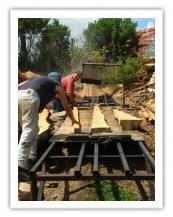 The sawmill was first established in the 1960's and we have owned it for 13yrs. On 7 Feb 2002 the sawmill was ravaged by a fire and there was literally nothing left, but with grit and determination and the support of our wonderful customers and locals, we soon rebuilt and have now branched out into making garden furniture & wooden crafts. Our furniture is displayed in a rustic woolshed across the road from the sawmill where customers can come & browse and enjoy a free cup of coffee. We specialise in Macrocarpa and furniture cuts and we have a variety of timber including native. We do private cuts and also sell firewood & sawdust, so contact us for prices on any of your timber needs. For more information, please see our products. Copyright © Pukeho Sawmills. All rights reserved.